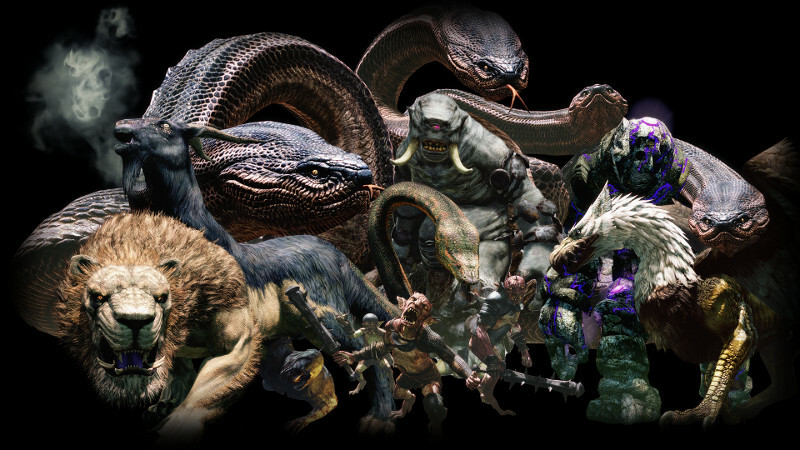 This post is part of a series on converting Dragon’s Dogma enemies to GURPS Dungeon Fantasy. Please go here for links to all other posts in the series. The first “monster family” I’m covering here is good old humanity! You might say they’re not monsters, but you should see what they get up to from time to time. Joking aside, human opposition can be easily built using the 62- and 125-point templates from DF 15, or the full PC templates from the other books for leaders or particularly skilled individuals. The ready-made henchthing templates from Mirror of the Fire Demon are also appropriate. Human opponents come in several forms, with the most common discussed below. The writeups focus on combat skills and tactics - feel free to add any other skills and traits appropriate to the specific characters you wish to include in your games. A bandit or brigand is someone who hides out in the wilderness and makes a living robbing passing travelers. People can turn to banditry for a variety of reasons. Some are civilians made destitute by a natural disaster and see no other option. Some have been convicted of crimes that would see them dead anyway if they showed their face anywhere civilized. Some, like Robin Hood’s merry men, might use banditry as a way to undermine a ruler they oppose. And some just like killing people and taking their stuff. Bandits are never encountered alone - they always bring a few buddies to better shank you with. While usually not very skilled as individuals, they’re clever about picking their battles and only attack when they think they can win. Bandit gangs range from a handful of thugs living in a small forest camp to a large and well-organized unit in a fortified position. These hidden bases are always relatively close to a road or settlement, which provides the gang with their main source of targets. Unless a victim looks important enough to be worth ransoming, Gransys bandits don’t usually take prisoners. The dead tell no tales! If a potential victim looks too tough to take on, they either leave or try to negotiate if that is not an option. The three largest bandit gangs in Gransys are the Iron Hammers, who occupy the ruins of Aernst Castle to the south; the all-female Labrys Bandits who occupy the ruins of Heavenspeak Castle to the northwest; and a large but nameless band of smugglers holed up in the canyons between Windbluff and Bluemoon towers. Most bandits are archers or light skirmishers. They prefer to shoot at targets from high ground and will only draw their swords as a last resort. They are usually fodder, though more powerful examples exist. Dodge 9; Parry 8 (shortsword); DR 2. Bow (13): 1d imp. Acc 2. Cheap Shortsword (11): 1d imp or 1d+2 cut. Traits: Callous, Code of Honor (Pirate’s), Greed. Equipment: Regular bow, hip quiver with 20 arrows, Medium Hardened Leather armor, cheap shortsword. These hardier sorts prefer the personal touch. Their job is to keep the targets too busy to get to the archers and spellcasters. They are usually worthies. Dodge 10 (11); Parry 10 (11) (broadsword); DR 3 (2 vs crushing). Cheap Thrusting Broadsword (15): 1d+2 imp or 2d+1 cut. Shield Slam (15): 1d cr. Traits: Combat Reflexes, High Pain Threshold, Bully, Bloodlust, Code of Honor (Pirate’s), Greed. Equipment: Cheap thrusting broadsword, small shield (DB 1), Jack of Plates, leather pot-helm. The brains of the outfit, they hang back with the archers and cast debilitating spells. They are usually worthies. Dodge 8; Parry 11 (Staff). Basic Speed 5; Move 5. Staff (12): 1d+2 cr. Enchanted with the Staff spell. Fireball (14): 1d or 2d burning, costs 1 or 2 FP. Spells: Itch-14, Spasm-14, Clumsiness-14, Hinder-14, Debility-14, Create Fire-14, Shape Fire-14, Fireball-14, Foolishness-14, Daze-14. Traits: Magery 2, Psychic Guidance (fireball), Bully, Callous, Code of Honor (Pirate’s), Greed. These make up the rank-and-file of an organized fighting force. Most are retainers in the service of a noble or wealthy merchant. They can also be mercenaries, working for anyone who can pay their fee. The latter aren’t very popular in Gransys, and are more common in other nations. They’re built much like bandits, but tend to have better gear and slightly higher combat skills. Marksmen use crossbows, and are trained to form firing lines and fire en masse. In smaller battles they keep their distance and focus on high-value targets like magicians. Crossbow (15): 1d+4 imp. Acc 4. Shortsword (13): 1d+1 imp or 2d-1 cut. Traits: Acute Vision 2; Night Vision 2; Duty (to lord). Equipment: Mail Armor, Steel Pot Helm, Shorstsword, Crossbow, Quiver with 20 bolts. Trained in polearm fighting, these soldiers emply short halberds that are equally useful on and off the battlefield. Dodge 10; Parry 11 (Dueling Halberd); DR 5 (torso); 4/2* (elsewhere). Dueling Halberd (16): 2d+4 cut or 1d+3 imp or 2d+3 imp. Traits: Combat Reflexes, Duty (to Lord). Equipment: Dueling halberd, steel breastplate, mail sleeves and leggings, steel pot-helm. This spell caster focuses on bolstering and healing their allies. Staff (12): 1d+1 cr. Enchanted with the Staff spell.